This evening, in neighboring Tempe, more than 3,000 people attended a “buy cott” organized by Tea Party activists, to show support of the bill and to encourage like minded folks to spend money in Arizona to counter the other side’s boycott. Both crowds were well below what was expected. The anti SB 1070 crowd was expecting about 50,000 people, the pro 1070 crowd was expecting about 10,000. 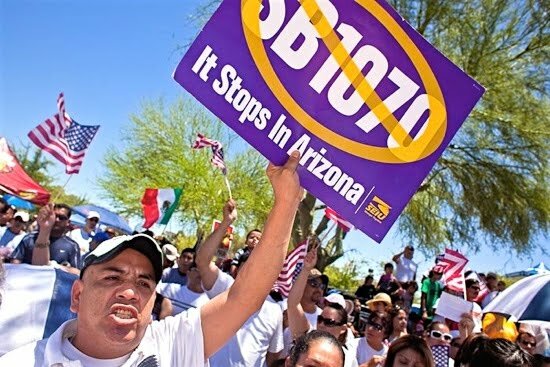 In a state that has been polarized by budget battles and deficits, nothing has polarized Arizona like SB 1070. Opponents of the bill claim it will lead to racial profiling and draw comparisons to apartheid era South African and Nazi Germany pass book laws. The law’s proponents claim it merely brings Arizona law into line with existing federal laws on immigration. Just as it’s a crime to be in the US illegally, it’s now a crime to be in Arizona illegally. Local police in Arizona now have the responsibility of asking for proof of immigration status in the course of an otherwise lawful contact and when there is reasonable suspicion that a person may be in the country illegally. I went to both protests today. And both protests were a lot more similar than they were different. Crowds at both were smaller than expected but the atmosphere at both was family friendly and a combination of angry and festive at the same time. There were a lot of American flags flying at both, with a few Mexican flags waving at the anti 1070 rally. There are more photos from SB 1070 protests in my PhotoShelter archive and available from ZUMA Press.